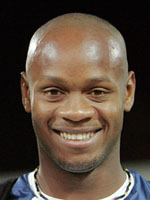 Gentle Jamaican giant Asafa Powell has proven beyond doubt that he is the fastest man on Earth, but so lacking is he in the big-day mentality there are serious doubts he will ever win a major 100-meter final. Adding to his Olympic worries is a chest muscle tear in April. But it is his 2007 record that says it all. Although he was the reigning world record holder with three 9.77 performances, American rival Tyson Gay shared the pundits' favors to win the world championships gold medal at Osaka, Japan. At the starting blocks the shy pastor's son was sweating profusely and remained with head bowed during the public roll call while Gay waved to the crowds. Powell was fast out of the blocks but as Gay pressured him at 60 meters his style went to pieces, his knees thrusting way too high. As Gay overtook him he again bowed his head, even appeared to stop trying, subsequently conceding even the silver to his distant cousin, the Bahaman Derrick Atkins. Gay took the gold in 9.84 and went on to win the 200 and the 4x100 golds while Powell's failure was met with derision and anger in Jamaica. And yet just two weeks later Powell smashed his own world record with an eye-popping 9.74 in the semifinal at the IAAF Grand Prix at Rieti, Italy. An hour later he ran 9.78 in the final. He has since lost the world record to his compatriot Usain Bolt, who clocked 9.72 on May 31 in New York while Gay ran 9.77 at the U.S. Olympic trials. He set his first world record of 9.77 in Greece in 2005 and equalled it twice in 2006, a year he won all six European golden league meetings for a cash prize of $250,000 on the way to being named male athlete of the year. And yet his trophy cabinet remains bare. At the 2003 world championships at 21 years old he was disqualified in the same quarterfinal as Jon "I did not move" Drummond. While out at the 2004 Athens Games he struggled home in fifth after setting the fastest semifinal time. He then missed the 2005 worlds with a calf strain and choked at the 2007 final. Before Gay's rise to prominence Powell had stood in the shadow of another American, Justin Gatlin, the 2004 Olympic and 2005 world champion, banned for eight years on doping charges in 2006. The highly religious Powell, whose favorite tune is the gospel song "Lord Walk Beside Me," initially fancied himself as an American footballer, and his brother Donovan who ran the 200 meters at the 2000 Olympics advised him against a career in sprinting. Looking forward to the redemption an Olympic gold at Beijing could offer him, the man who has called for doping offenders to be jailed has predicted his best possible 100 time could well be below 9.7 seconds.